You have a tight schedule for visiting places near Tokyo? 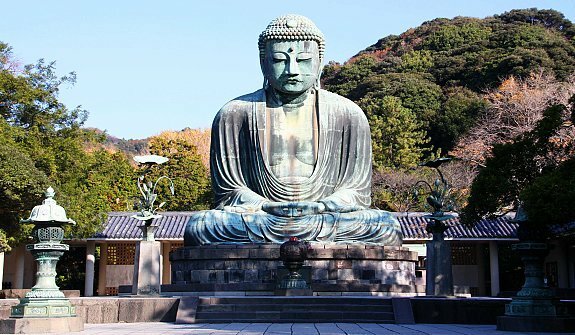 Don’t miss Kamakura from your list! Kamakura is about 1 hour by train from Tokyo station. You not transit on your way as it is directly connected by JR line from Tokyo to Kamakura. Though you can drop by Yokohama for a while if you wish. What do you plan to do if you are looking forward to a compact tour plus an exercise for your body? Well, our answer is cycling! Get-off at Kamakura, or my recommendation is, at Kita-Kamakura station where you can find a cheap Rent-a-bike store for‎ ¥1000 per day! You can also ask for more details at the information desk inside the station if you are not sure about renting a bike. Be wise, because some shops offer bike rentals for an expensive price, such as ‎ ¥1400 only 2 hours?! Geezz… don’t ruin your lunch fee for that. Every bike rental shop will give you a map and also a good advice for selecting routes that you should take while traversing your way around Kamakura. Here are my personal suggestions. Meet the mini Arashiyama, Hokokuji Temple. Hokokuji temple is about 15-20 minutes away cycling from Kita-Kamakura. Here you can find a beautiful little bamboo forest by paying about ¥200 for the entrance fee. You can also see from afar arranged statues (I am not sure if it is a cemetery or not) in a cliff. They also have a beautiful mini garden for Zen garden temple in Japan. Take a 5 minutes cycling route and you will end up right in front of Jomyo-ji, another temple. It has a beautiful garden with a white coloured temple inside. It is beautiful but since it is small in size it won’t take more than 10 minutes of your time. Take a look around the temple area, relax, rejuvenate and get back on your bicycle. Before you begin, check the map and start cycling to Kamakuragu Temple. The temple is not that big and I also bet that nobody notices the existence of this temple. You can enjoy the quietness and take a picture of its mini tower. Hold your breath because you can also vist Tsurugaoka Hachimangu next after Kamakuragu. Tsurugaoka is also one of the must-visit temples in Kamakura. Actually Tsurugaoka temple is located near the station and shopping district of Kamakura. You can take a break and have lunch here after visiting Tsurugaoka. As Kamakura has various food to offer you will be spoilt for choice. You can find Chinese, Italian, Japanese and also Indian restaurants around here. Done with your sighseeing in central Kamakura? Get on your bike and continue your adventure to the west of Kamakura. There you can find Zeniarai Benzaiten temple, another famous temple in Kamakura. There is a myth that if you wash your money in the temple’s waterspring then those washed money will multiply! Well, it’s just a myth though, believe it or not. Get over your excitement from the multiplying money, and pump up all your strength to cycle to the Great Buddha Statue. This statue is a renowned icon of Kamakura. Try to arrive here before 16:00 hours because if you are late, then you won’t be able to enter the temple. But you can always take some good pictures of the statue from the outside. Lastly, hold your breath and feel the sunset breeze in Yuigahama. The beach has beautiful white sand and a surreal scenery of sunset. It will be the perfect destination to close your day off after cycling in Kamakura. While you take a break after a long ride focus on the sound of the waves. It will give you a sense of calm. Finally, don’t forget to return the bicycle back. Finally to prepare for this journey, it’s essential for you to keep a good health condition, a lot of energy and a bunch of energy-bars and snacks with enough water to last you for the trip. Have a good day in Kamakura!